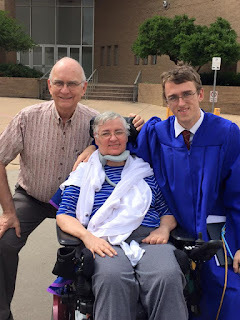 Yesterday, my oldest son graduated from High School. There were many amazing moments, loads of emotions, and even a frustrating/scary incident (involving two families and the police right behind us). But the highlight of the day was my mom being there. Mom has always valued education and she has passed that on to my sister and I as well as our children. Mom has ALS, and to be honest, we were not sure she would be here to watch her oldest grandchild graduate from high school. So you can see why this is so important to all of us. Graduation with a large high school and at the convention center, makes meeting up with each other after kind of challenging. Mom also has limited stamina and needed to go home as quickly as she could following the ceremony. Jon knew that Nana would stay as long as she could, but there was a chance he might not see her at the ceremony. Jon wanted to see his Nana. He loves her so much and was so honored she was able to make it to the ceremony. Jon exited the opposite side of the convention center, than we did. Nana was tired, so we were trying to get her to the van and loaded as quickly as we could. Jon called his dad who told him where we were and to hurry. He made his was across the convention center as quickly as he could, dodging so many people as he made his way to the opposite side. He wanted to see his Nana. Once outside, Jon and Scott started walking very quickly trying to catch up with the rest of us who were helping Mom get to the van. He saw us in the distance, van ramp down and about to load her into the van. He started running fast, hat and diploma in hand and blue graduation gown flowing behind him. I stopped Dad from loading her. Jon had made it. Hugs and kisses were given. A glance that told Jon how proud his Nana was of him. Papa, my dad, gave him a hand shake and huge hug. Then we took some very special pictures right there on that special day, at that special location, in the special moment.